It always happens. I make something with the intent of selling and inevitably want desperately to keep it. You may remember that this was one of my spoils in a recent yard sale frenzy. It’s the first thing I wanted to transform from my arsenal of furniture because I immediately had a gilded vision for it. 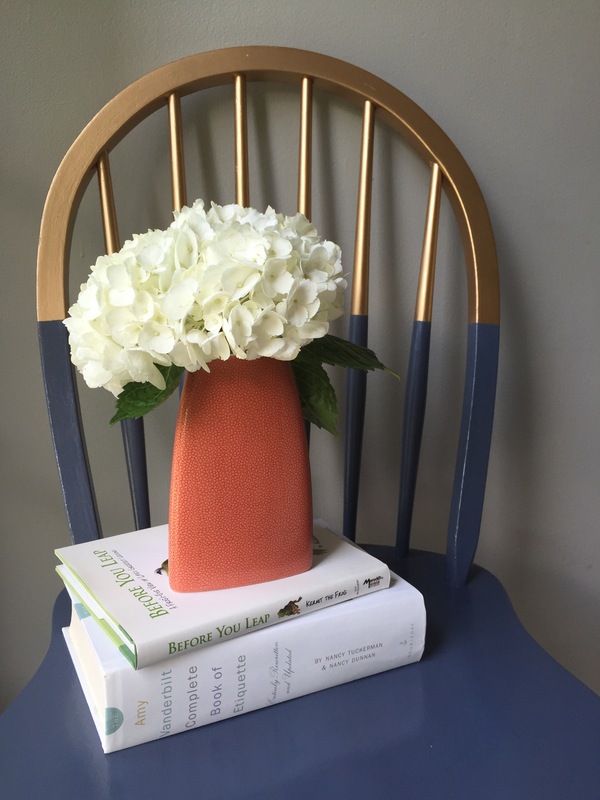 My recent obsession with navy and gold has spread now to my furniture creations! 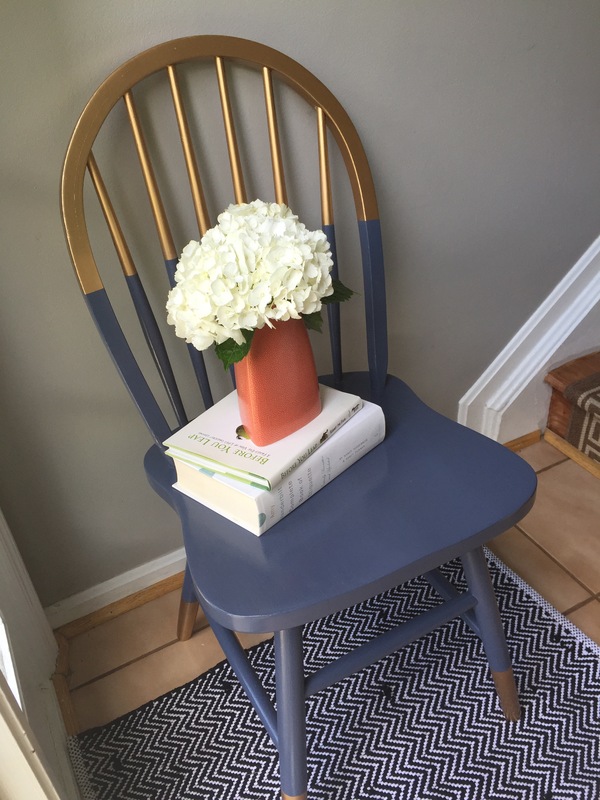 I painted this with gold metallic paint and a slate/navy by Benjamin Moore called Newburyport Blue. 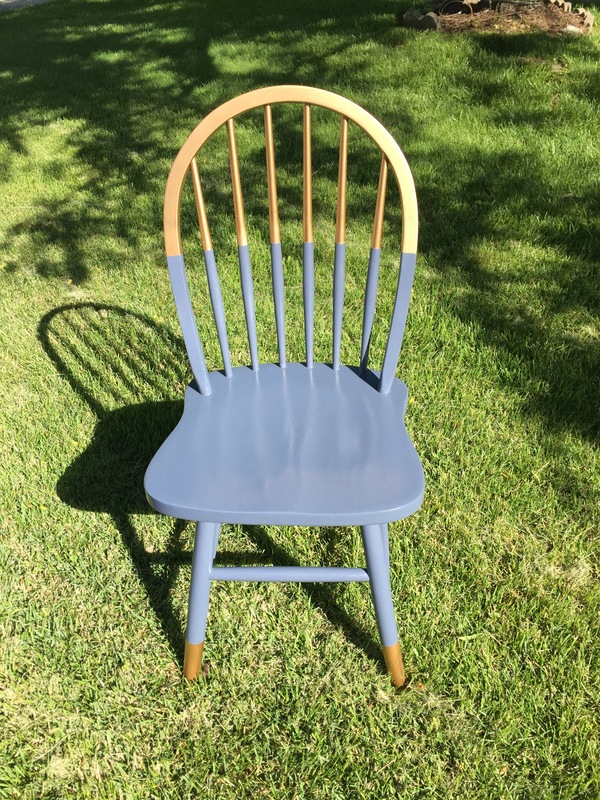 Arch spindled back chair hand painted with chalk paint: Ben Moore Newburyport Blue and gold enamel. Gloss finish. Classic chair can be used at a desk, as a side chair. I’d love to see it in a collection of mismatched dining chairs at a dinner table. PSST… you can follow me on Instagram by clicking on the Instagram link to the right (in the sidebar) or by finding @hildagotrocks on Instagram. I’m also on Bloglovin’ + Facebook + Twitter which are linked in the side bar as well. I often post in-progress projects, inspirations and articles/blogs I’m into there. Facebook also has all of my sale listings in real time. 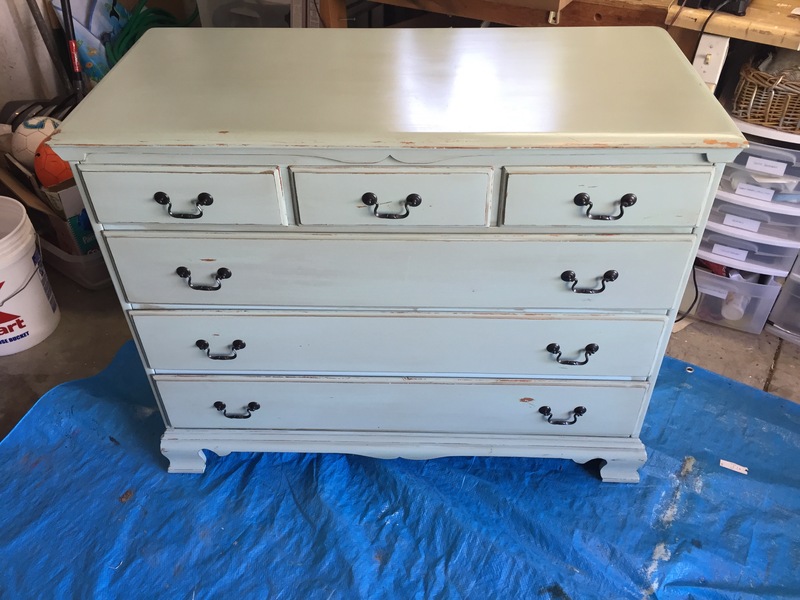 I recently finished this dresser. It was given to me by someone who knew I could give it a new life and a new home. After quite a bit of elbow grease and lovin’ this thing has a whole new attitude! And it is for sale! 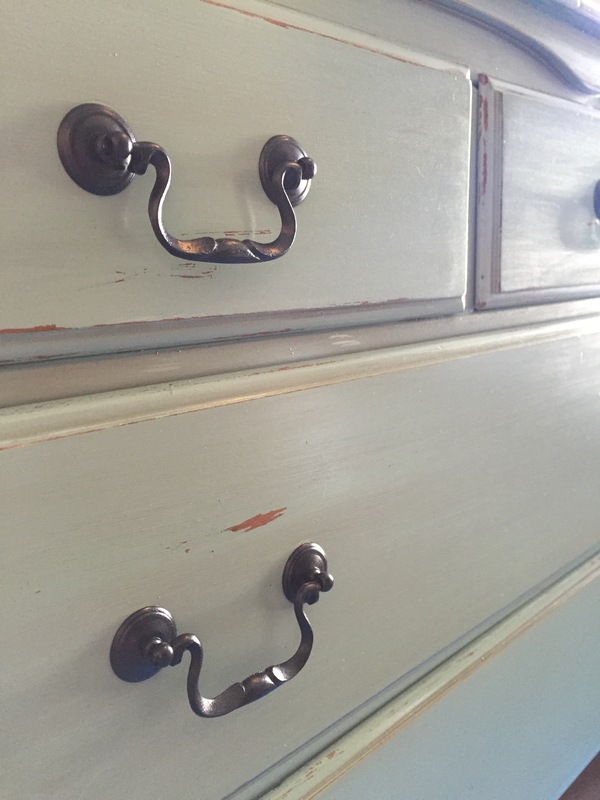 Chalk paint in Benjamin Moore Waterfall, distressed and washed in custom mixed Minwax dark stains. Sealed in satin polycrylic (not wax). 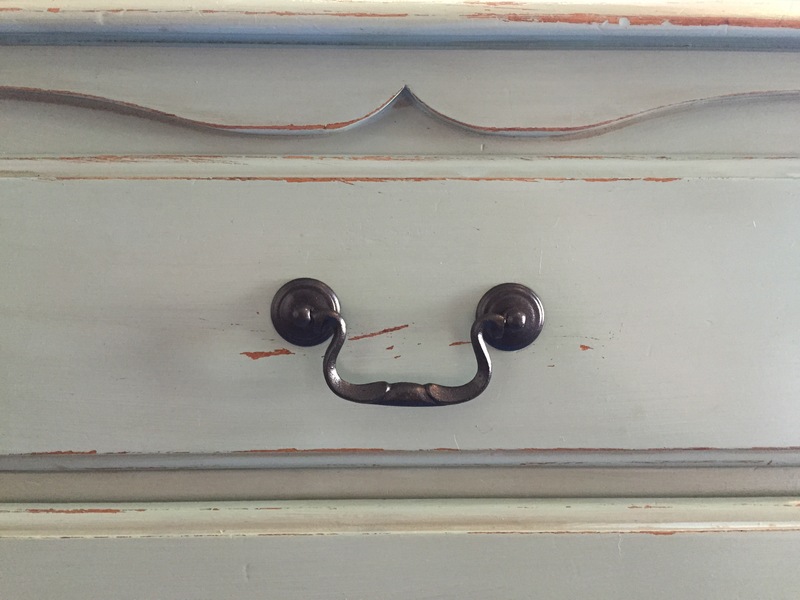 Solid maple dresser with PLENTY of details and even dovetail joints! I’ve chosen to keep the original brass hardware and repainted it in oil rubbed bronze. 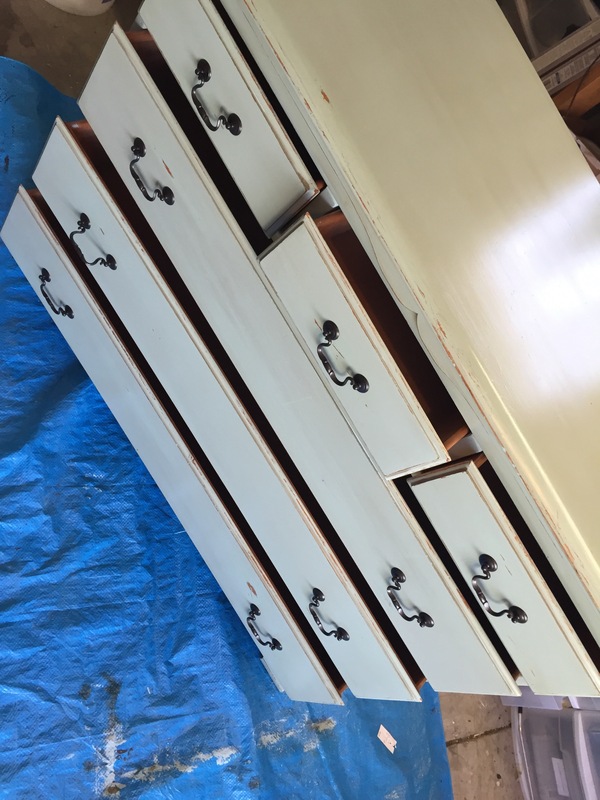 Measures 44″ wide, 35″ tall, 20″ deep with drawers at 5.5″ vertical depth Shallow drawers- may be best as a child’s dresser, accent piece, bedside table or even a bar or tv stand! $350 in Cincinnati area! Hurry, price goes up when I list it in my etsy shop at the end of the month! Email hildagotrocks@gmail.com or message me on Hilda’s Facebook page! 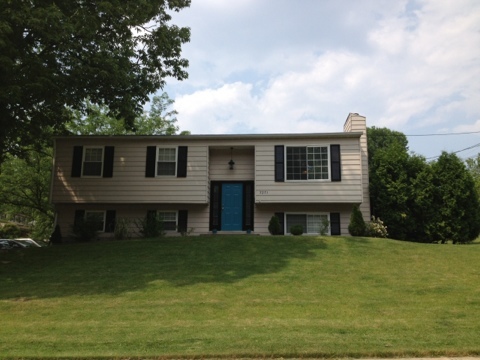 When we bought the house the entry looked like the photo below. Nothing terrible. But nothing special either. 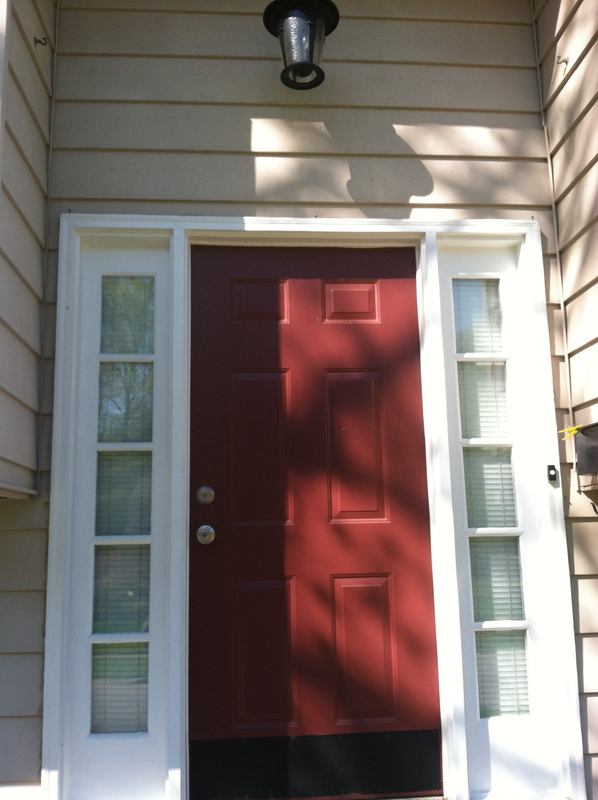 It also happened to match all of the other front doors in the neighborhood (burgundy, navy, hunter green). We also weren’t feeling the black kickplate. It was cutting off the door and made everything feel sort of shorter. 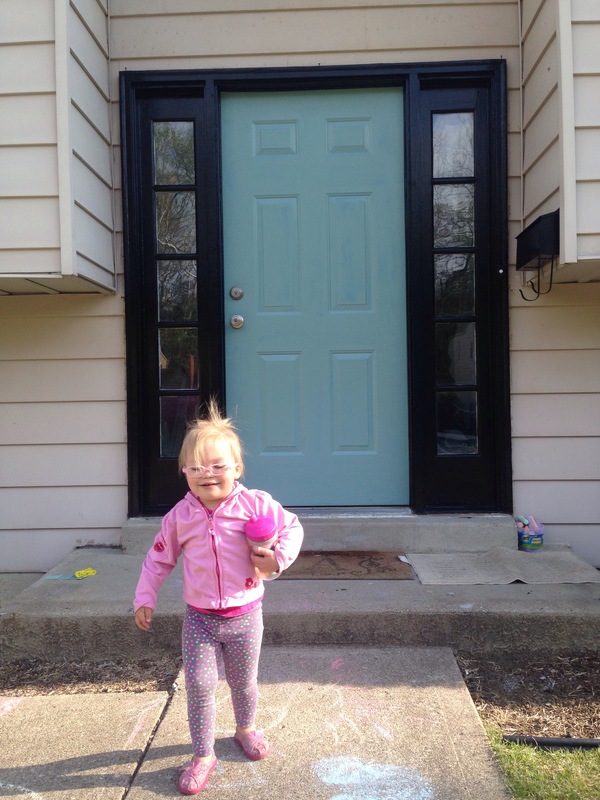 About 6 months after we moved in (and 3 months after we had O) I got the wild hair to paint the door teal. I wanted something brighter, bolder, and unique. Teal is one of my favorite colors so why not? (Side note: I once lived in a purple Victorian with magenta trim and teal accents as a kid. I’m not afraid of color. My parents still had a purple front door until last summer. Color crazy is in the family.) I also removed the kick plate since I figured I’d be able to reattach it if we changed our mind. 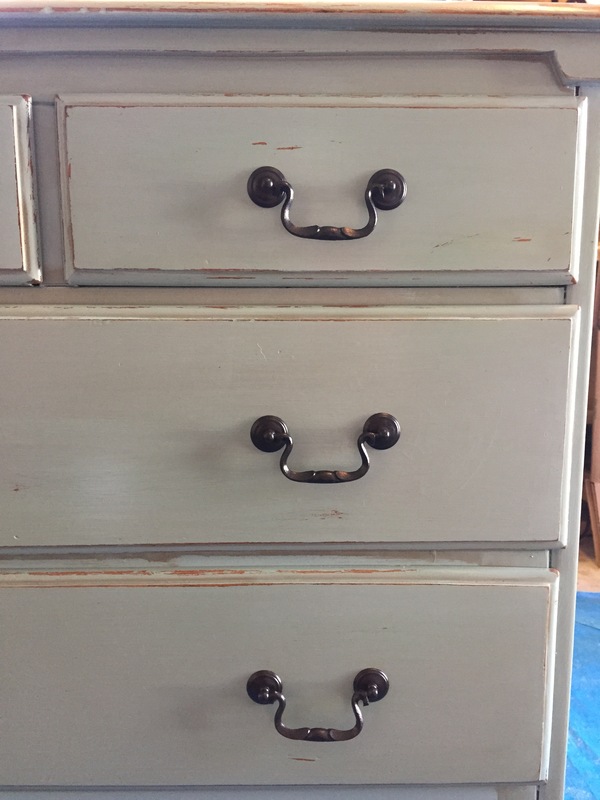 But then I realized it was a brass and had been spray painted black… removing the screws prompted it to begin to chip and peel. Happy accident? I think so. 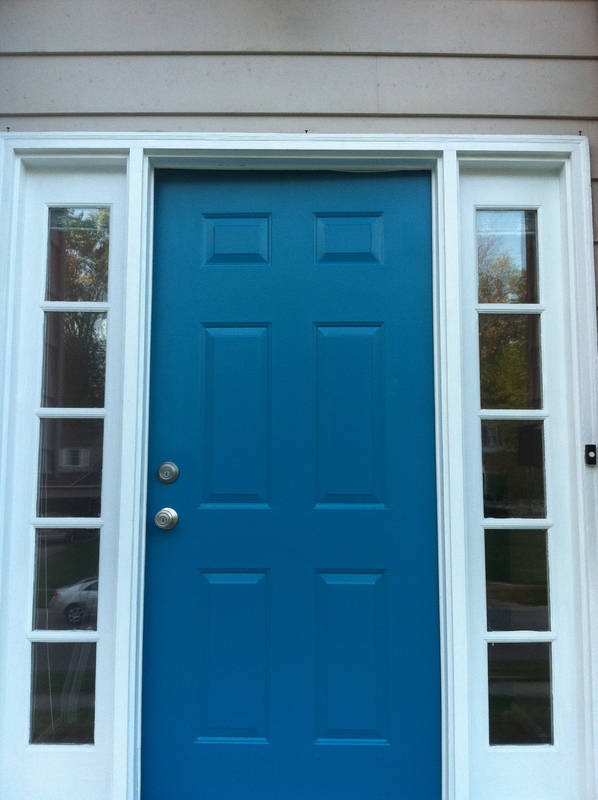 Below is the teal door sans kick plate. For a while I just stood back and admired the door. I loved it but something was missing. A few weeks later Molly and I grabbed some black trim paint on a whim when we were out getting other things. 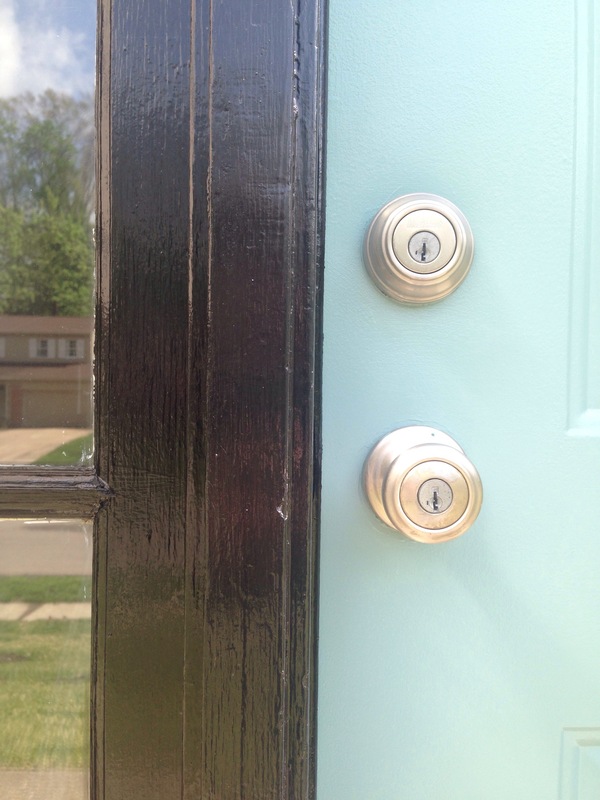 It took two coats but it was the best decision ever because it really made the door pop and the house feel more cohesive with black shutters, light fixtures and trim. I posted about the trim here. PS- You can see the giant half dead tree that we just had removed in the pic below too. Alas, I was ready for change again. 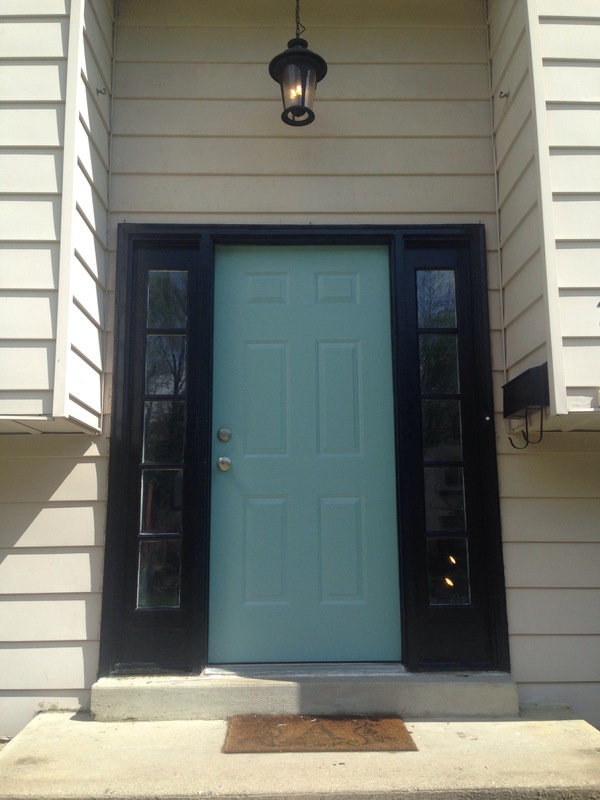 Hubby insisted that the teal door had really grown on him and had urged me to reconsider. But he went out of town last week and so I had a little paint fun. Of course, I knew that I may have to paint it back to teal again if this blew up in my face. That’s where the leap of faith came in. I popped into Ace on my way home from work and chose a paint color on the spot. 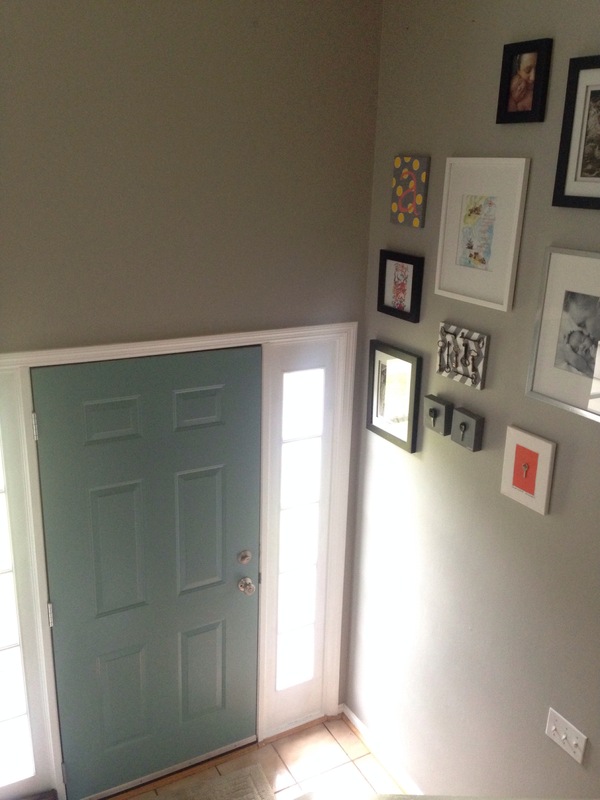 Perk: The guys there know me now and gathered around to help me chose a color to pop against the black trim. 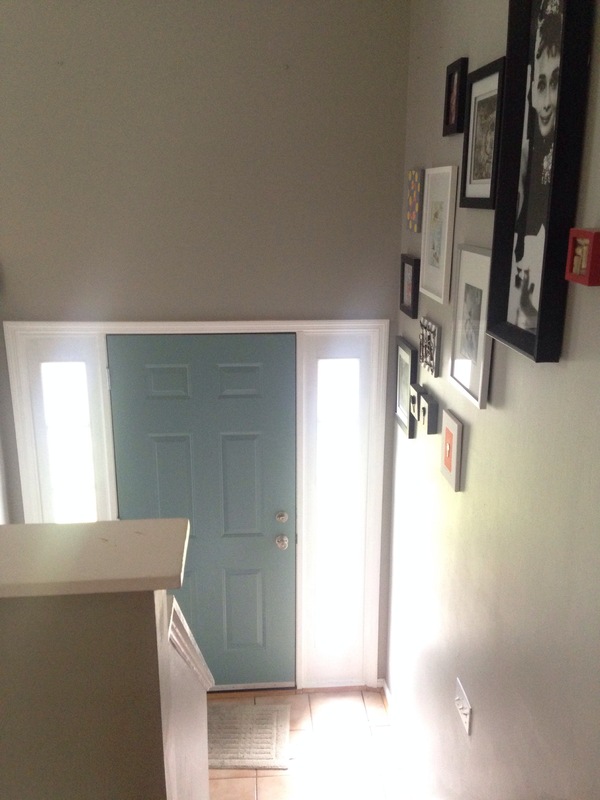 With their help, I chose Mill Springs Blue by Benjamin Moore. It has a sort of washed-out mint vibe. 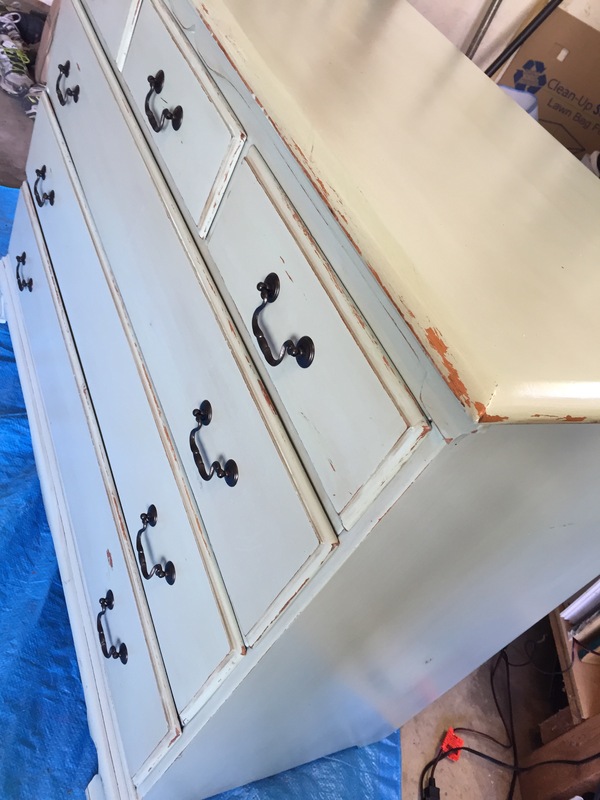 I had it color matched to a paint and primer combo quart of Clark+Kensington outdoor semigloss. I was looking at the lighter swatch “Covington” right next to it but Molly gets the credit on selling me on a slightly darker tone (via text) and going with the Mills Springs Blue. I did the project in stages over the next few days. After all, this was done after work, dinner, O’s bath and bed so I usually only had an hour before sunset. 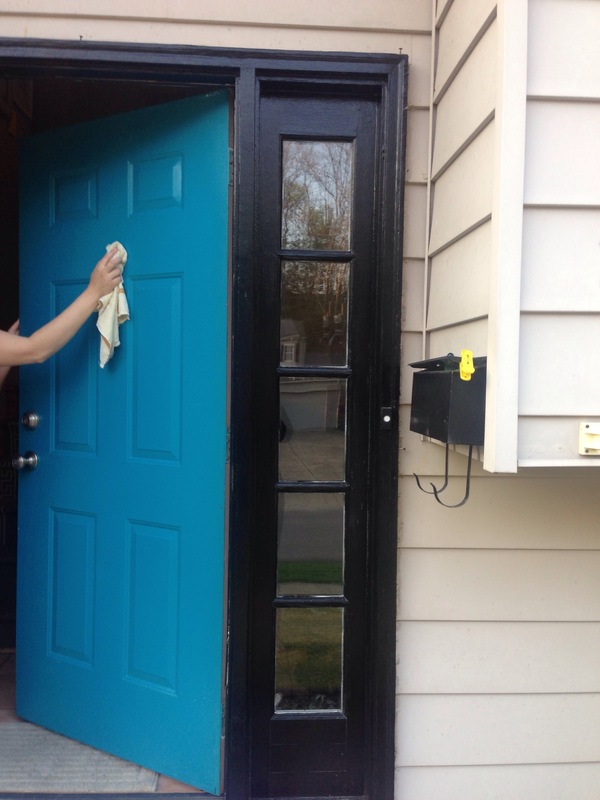 Basically, one day I did a new coat of black on the trim while Molly scraped and repainted the mailbox. 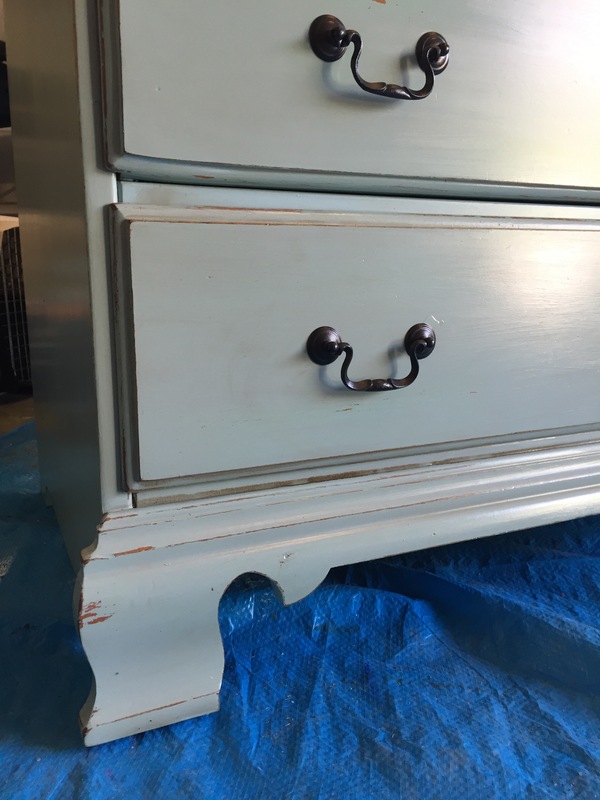 Then the next night I wiped the door down with vinegar/water and then liquid deglosser that I had left over from the sofa table project and I did the first coat of my new grayed out minty green color. As you can tell below, the two colors are very different. At first I worried that this may be a disaster. But after the first coat I was really loving the cooled down effect of a softer color. O liked it too. The second coat stole my heart. Seriously perfect. Although the front stoop is a bit bare (planters are on my list), I’m really feeling our new mini-makeover. Boom! Here’s a close up of the pop effect the black and mint have together. Yummy. 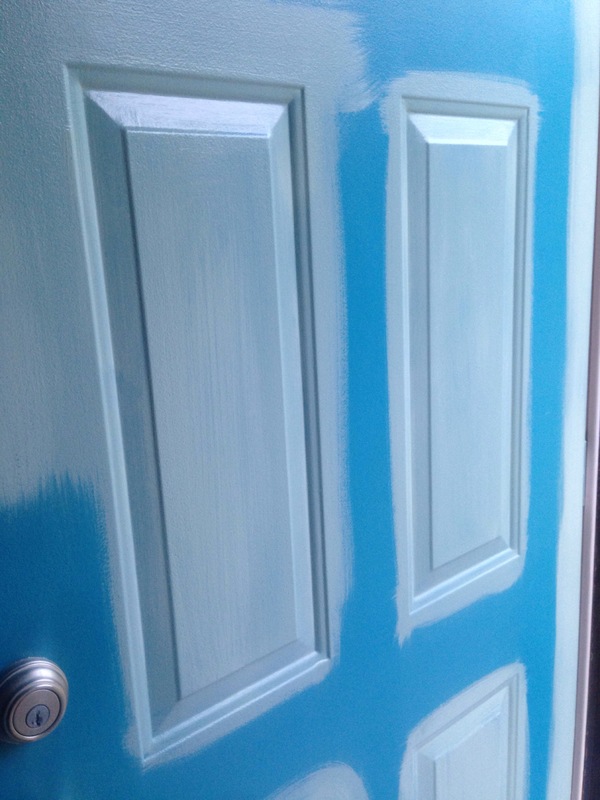 Yes, I still painted the inside of the door. Its just a tradition now! I think that the cool tone of the soft green really meshes with the rest of the inside decor which is mostly grays, creams, and some sea-glass tones with pops of white, wood and yellows/oranges. Above is the view from the corner of the family room at the banister/half-wall and below is the view from the kitchen entry where it meets the hallway at the top of the steps. Now I think just need to get something for above the door but I’m blanking on ideas. Thoughts? 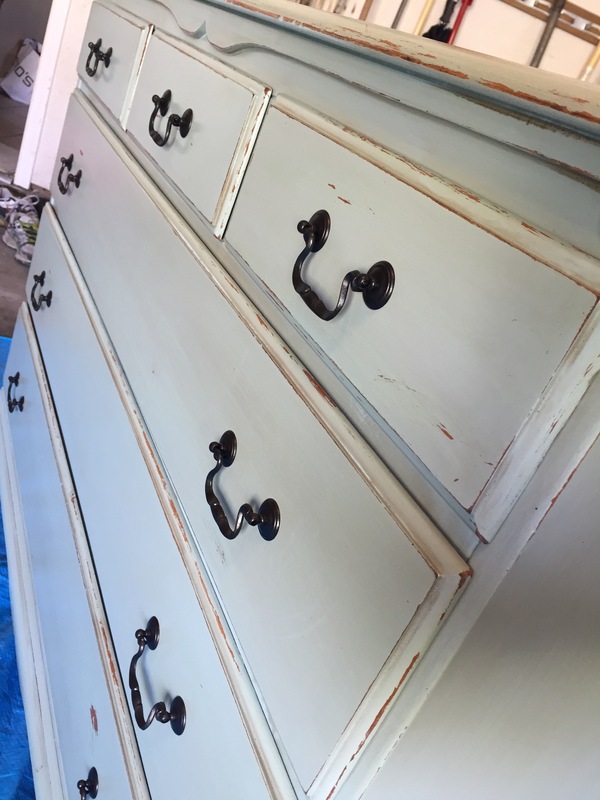 I’ve said it before and I’ll say it again: Paint can make some really amazing changes for a reasonable cost. For months I have been plotting revenge on our teeny tiny cave of a half bath. It is the only room in the house I haven’t painted (except the kitchen… more on that another day). I’ve been putting this project off for a few reasons. The first is time. I never have a span of time long enough to knock it all out. The second is that choosing a color proved to be a huge hurtle. Hubby pulled the “I don’t care. Surprise me.” card… I was torn over “Zen” green left over from the guest room or the soft “Glass Slipper” left over from the master bedroom. Anything but that brown paper bag color that haunts this entire place. Third issue: this tiny room is riddled with problems. 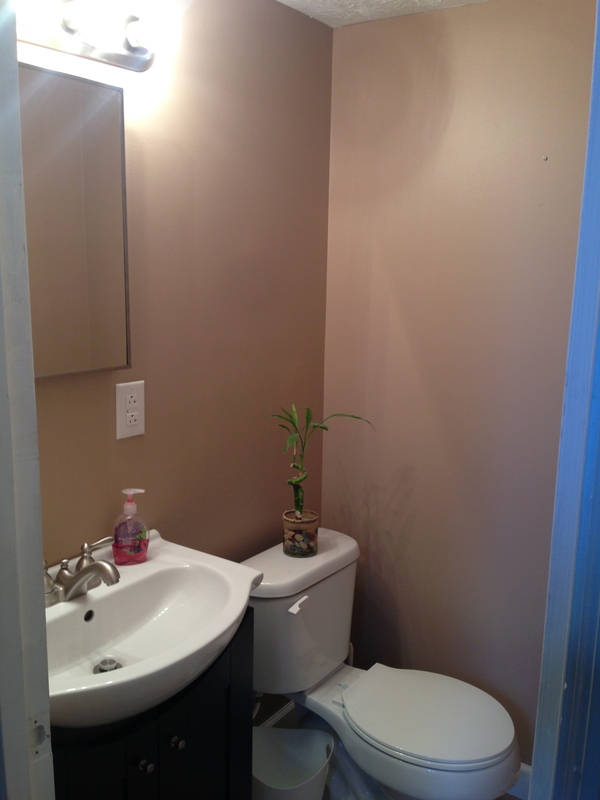 Although it has all new fixtures as well as new tile and vanity, the walls are poorly mudded (result of s speedy/sloppy drywall job by previous owner… like most of his paint jobs around here. If I ever see him in Home Depot so help me…). And with the poorly treated walls comes gapped trim work. 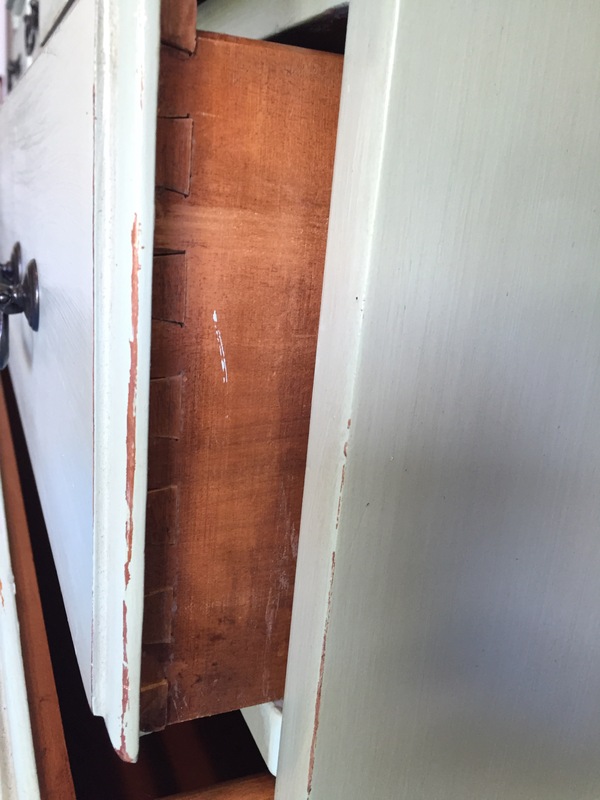 It is still only the store primer white- you can see the nails in it and they aren’t flush with the walls. Nobody took the time to paint it. I’ll likely be caulking around the entire baseboard trim, filling the nail holes and painting all the trim soon. Also, This bathroom sits under the ventilation soffit that divides the lower level of the house. The soffit is a foot deep and brings the ceiling to a whopping 7 feet above you. Now you see how tiny this thing is… from side to side AND top to bottom. 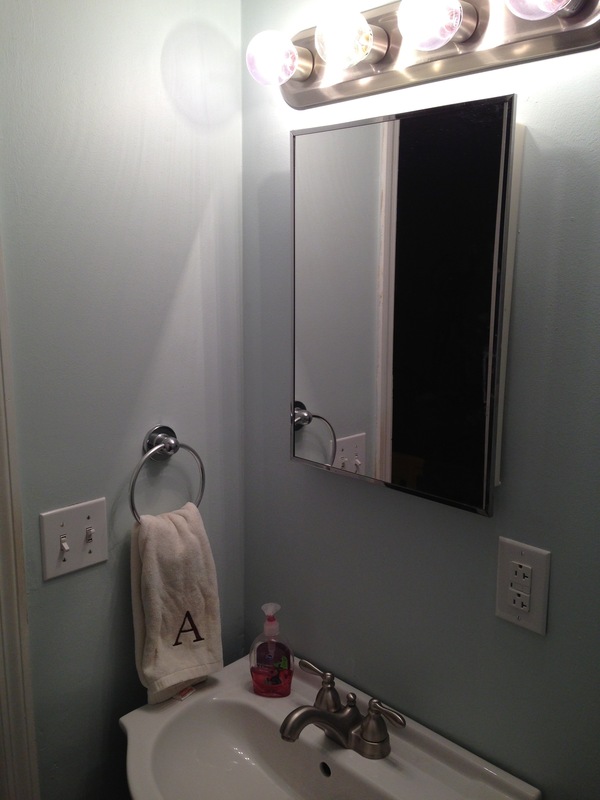 The last problem and biggest challenge is that the vanity sits a convenient 3.5 inches from its adjoining wall. You can kind of see in the photo below. Just enough room for my hand… but not a roller. As for color, I went with the Glass Slipper by Benjamin Moore left over from the master bedroom. It really brightened up the dull walls and feels much fresher and cleaner. Bonus: this project had no cost. There is still quite a bit to do to accessorize but for now I’ve tossed the quote canvas on the main wall and added a basket on the toilet. 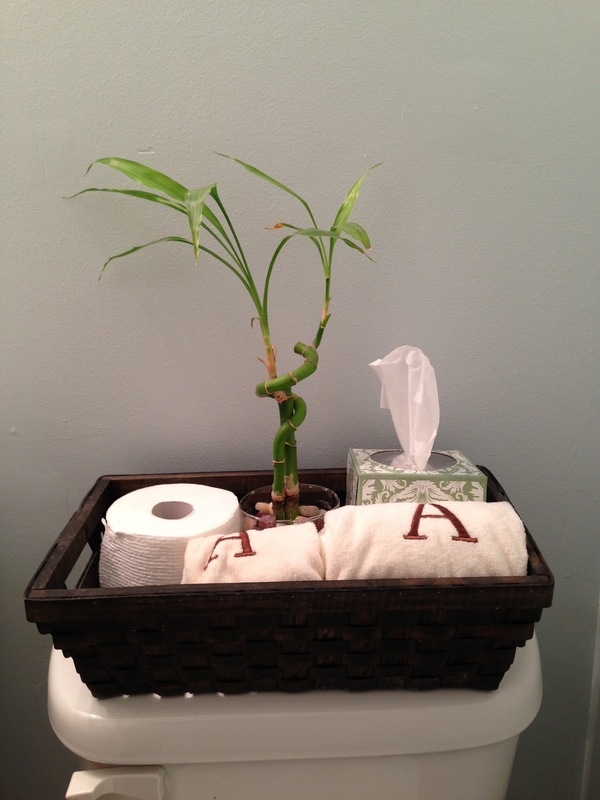 The plant already lived on the top of the tank, but I placed it in a basket, added a box of tissues, some monogrammed hand towels and a roll of toilet paper. You know, just in case. This is the only accessible counter space in the bathroom therefore it is the only place for tissues etc to go. I’ve been playing with the idea of a wall shelf or two above the toilet but the basket is doing the job for now. 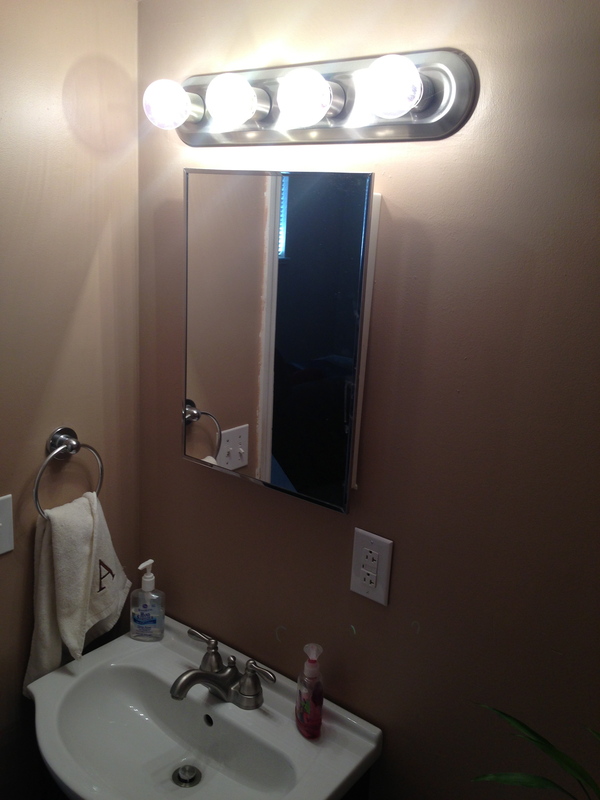 The vanity and mirror both have minimal storage for soaps and such though. Everything feels lighter and brighter. Hubby and I were both pleasantly surprised. Interestingly enough, the lighter color in a satin finish actually disguises the imperfect walls. I think the white of the sink looks cleaner and newer too. Amazing what a coat of paint can do. Next: wall art (boy do I have a surprise up my sleeve on that one), potential storage and hospitality items.